STROMAE, Europe is Listening: Musica, Maestro! You are at:Home»NOrdinary»STROMAE, Europe is Listening: Musica, Maestro! It is clear: Stromae, Maestro in verlan, enjoys wordplay and poetry. His real name though is Paul Van Haver. He is a francophone singer and a song-writer. To the surprise of many, he is not French! Paul was born in 1985 in Belgium, and he is the son of a Belgian mother and a Rwandan father, who was killed in the Rwandan genocide in 1994. Stromae, a New European, is yet another example of Europe’s multiculturalism. His mixed background is often reflected in his work. Remember the song Papaoutai? Difficult to forget once you saw the video. A masterpiece, inspired by his own experience, describing just too well the sentiments of young people, growing up without their fathers. 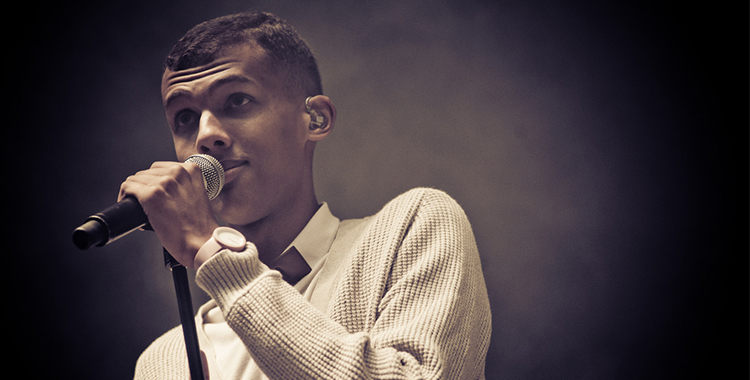 Papaoutai, included in his second album Racine carrée (2013) invites the audience to discover Stromae’s multicultural wealth through a combination of styles: Congolese Rumba and electro-house. The video includes even more different styles, e.g. break-dance, African styles, ballet, Irish step-dance and hip-hop. When paying attention to the lyrics, you quickly realise the deeper underlying criticism Stromae addresses in his songs. He emphasises the particularly severe situation of the European youth, a group that has been seriously affected by the crisis. We are talking about a 23.4% of youth unemployment in the European Union. Just listen to Alors on danse, included in his first album Cheese (2010): the song talks about young people that spend a lot of time partying and dancing, in the hope of forgetting their loneliness, unemployment issues, and other problems. A number 1 hit in over 19 different countries. Unemployment, infidelity, divorce, illness, environment and gender issues are among the main topics that inspire his music. All of them very controversial, as they are reflecting the harsh reality of the European society. On many occasions, Stromae explained that his intention is not to spread pessimism but to be realistic in addressing serious concerns. In times when Europeans need support in facing societal problems, Stromae sends a strong signal. By creating something beautiful out of the widespread melancholy, he shows us the way to accommodate to a time of profound disenchantment. Time to dress up, it’s the European Carnival season!